Palestinian tanna of the third generation (2d cent. ); son of a Babylonian exilarch. For some unknown reason he left Babylonia and his bright prospects there for Palestine, where he was made chief of the school at Usha (Hor. 13b; Grätz, "Gesch." iv. 185). Later he was entrusted by the patriarch R. Simon b. Gamaliel III. to secure a reconciliation with R. Hananiah of Babylon, who had declared himself independent of the Sanhedrin of Judea and had established one in Babylon—a mission which Nathan, in company with R. Isaac, successfully executed (Grätz, l.c. pp. 188 et seq.). 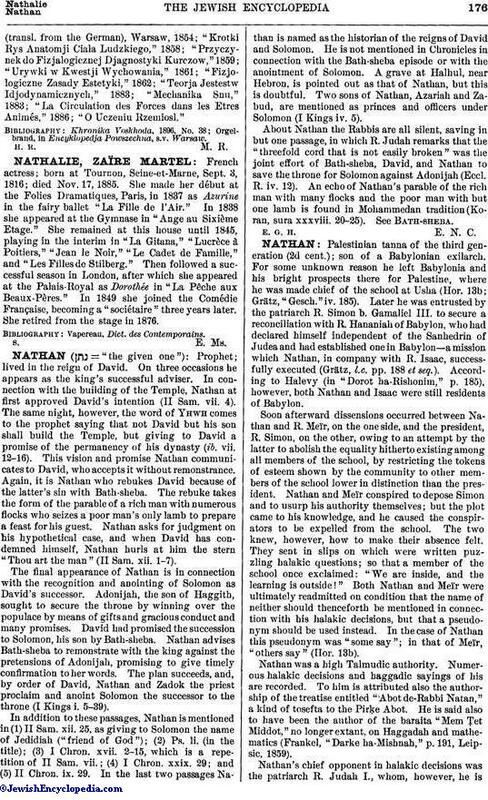 According to Halevy (in "Dorot ha-Rishonim," p. 185), however, both Nathan and Isaac were still residents of Babylon. Soon afterward dissensions occurred between Nathan and R. Meïr, on the one side, and the president, R. Simon, on the other, owing to an attempt by the latter to abolish the equality hitherto existing among all members of the school, by restricting the tokens of esteem shown by the community to other members of the school lower in distinction than the president. Nathan and Meïr conspired to depose Simon and to usurp his authority themselves; but the plot came to his knowledge, and he caused the conspirators to be expelled from the school. The two knew, however, how to make their absence felt. They sent in slips on which were written puzzling halakic questions; so that a member of the school once exclaimed: "We are inside, and the learning is outside!" Both Nathan and Meïr were ultimately readmitted on condition that the name of neither should thenceforth be mentioned in connection with his halakic decisions, but that a pseudonym should be used instead. 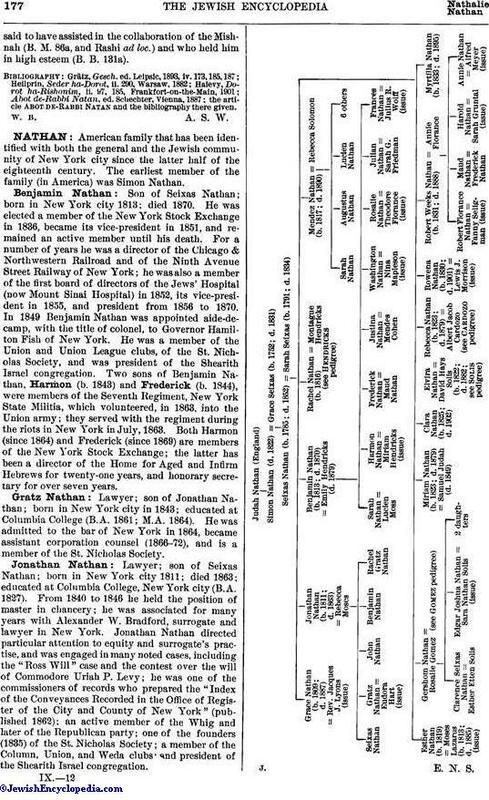 In the case of Nathan this pseudonym was "some say"; in that of Meïr, "others say" (Hor. 13b). Nathan was a high Talmudic authority. Numerous halakic decisions and haggadic sayings of his are recorded. To him is attributed also the authorship of the treatise entitled "Abot de-Rabbi Natan," a kind of tosefta to the Pirḳe Abot. He is said also to have been the author of the baraita "Mem Ṭet Middot," no longer extant, on Haggadah and mathematics (Frankel, "Darke ha-Mishnah," p. 191, Leipsic, 1859). Nathan's chief opponent in halakic decisions was the patriarch R. Judah I., whom, however, he issaid to have assisted in the collaboration of the Mishnah (B. M. 86a, and Rashi ad loc.) and who held him in high esteem (B. B. 131a). the article Abot de-Rabbi Natan and the bibliography there given. W. B. A. S. W.